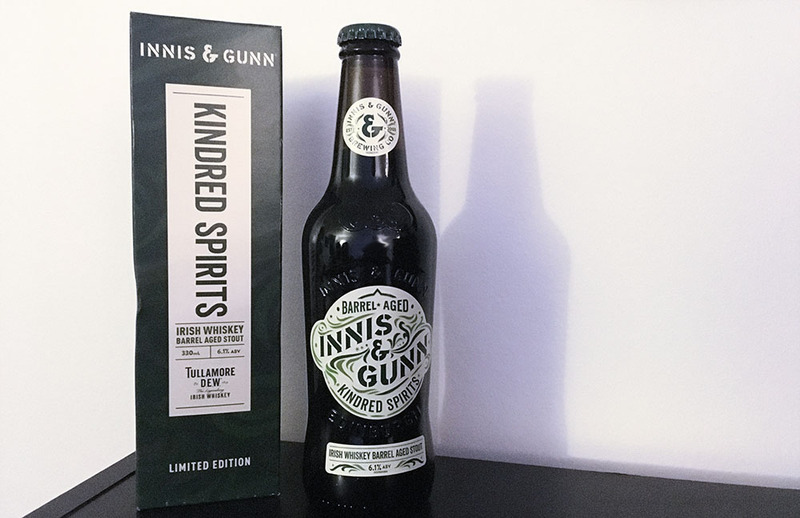 Innis & Gunn have released their latest, limited edition Kindred Spirits Whiskey Barrel Aged Stout, just in time for Saint Patrick’s Day. This is a collaboration between the Scottish brewer and Tullamore DEW, makers of “the legendary” triple distilled Irish whiskey. Kindred Spirits starts with Innis & Gunn’s Scottish Stout, made using the brewer’s unique barrel aging process. It is then matured in Tullamore’s triple-distilled, triple-blend whiskey barrels. This smooths out Innis & Gunn’s stout to create a stout that doesn’t taste like most stouts. It tastes better. Kindred Spirits pours a lovely deep, dark, opaque brown without the viscosity of many other stouts. A nutty brown foam tops the glass and accentuates the strong (strong) nose of hops, barley and, honestly, beer. At first sip, it’s smooth and oddly light, for a stout. There are notes of vanilla, chocolate and some subtle coffee sneaking in on the mid-palate. It’s a strong, rich stout – but not heavy. The mouthfeel is reminiscent of an ale or lager. The finish lingers with bitter astringency that isn’t unpleasant. Luckily, there’s a lovely sweetness that cuts through the bitterness to leave you wanting more. A perfect stout to sip on Saint Patrick’s Day (especially if you’re not a fan of thick, heavy stouts).